So yesterday I admitted that I don't get the appeal of Halloween. Bad me. On November 1st however, Mexico hosts a holiday I could really get behind. 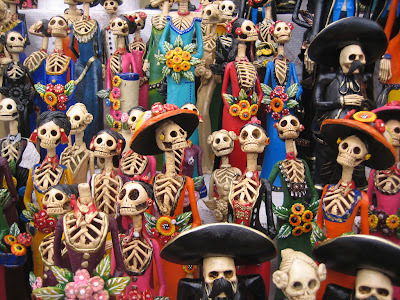 It's el Día de los Muertos, the Day of the Dead. El Día de los Muertos takes the idea of the Roman Catholic All Saints day (which is also today) and merges it with the democratic impulses of All Soul's day (which is tomorrow). Setting aside a day out of the year to honor my dead loved ones? Sign me up. I love this holiday from the sentiment to the imagery. I lived in Southern California for three years where this celebration was (and is) much more prominent. I think the sentiment of it is as beautiful as the imagery. So much so that I'm tempted to construct an ofrenda today.